Protoclassic, 100 B.C. to A.D. 250. 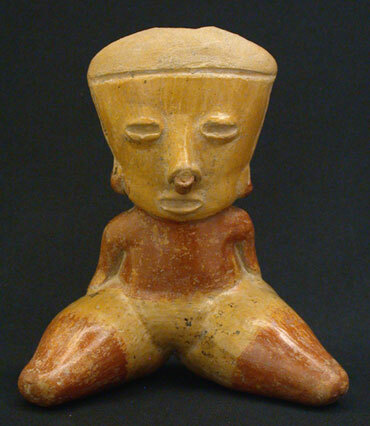 This Chinesco Type 'D' seated female figure from Nayarit, Mexico, holds her arms held to the sides of her waist, tapering legs outspread, and heart-shaped face with deeply lidded eyes and recessed mouth. The coiffure is an unslipped beige with an opening at the top of the head. She is adorned with red-painted ear ornaments and nose ring, and has overall burnished contrasting creamy beige-yellow and red slip decoration. Provenance: From a Southern California collection formed in the 1960s. Condition: This figure has some minor manganese oxide and other sporadic surface encrustations, and is in near-perfect condition.